Two of the things Kenya has taught me are timing and patience. I am constantly amazed at how each have their place here in Maua. Take the case of this lily. I do not know its official name, but I call it the Once-In-A-Year lily. I took this shot one year ago. I first came across it down near the Meru National Park, about 15 km from where we live. It is a very dry area, and this beautiful splash of color caught my eye. In a sea of brown, the red and white and green made a statement about life and the power of life – even in a desert. 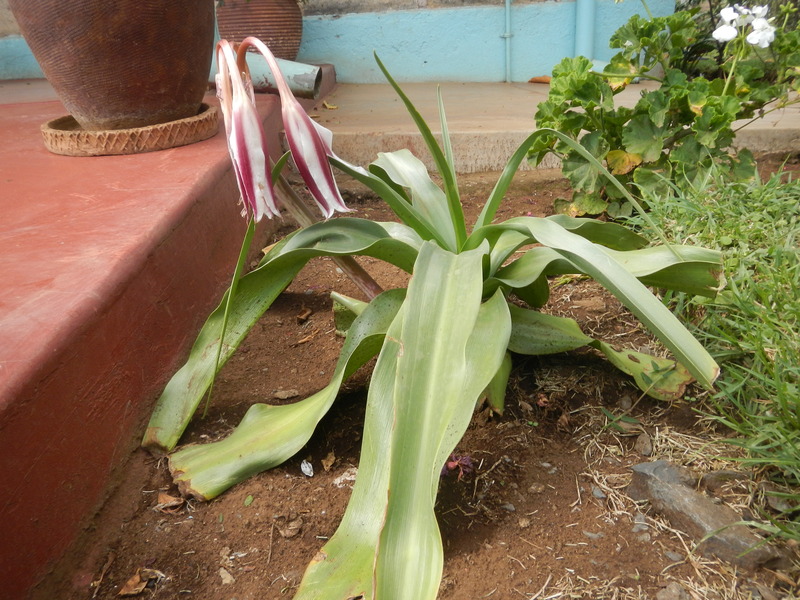 So I found one and transplanted it in the hopes it would come to life in our garden in Maua. For a year it sputtered and wilted and revived….until one day last week I went outside to feed the cats and saw that it had bloomed. Wow! I thought, I am truly a green thumb! I planned on rushing back inside and getting my camera, but my phone rang and I moved on to something else. When I returned home later in the day I saw it again, admired it, and started to get my camera. But it had been a long day, and when I sat down and started taking the camera out of its pouch, I figured it would wait until the next morning. It just felt so good to sit! The next morning I went out, fed the cats, and took this photo. 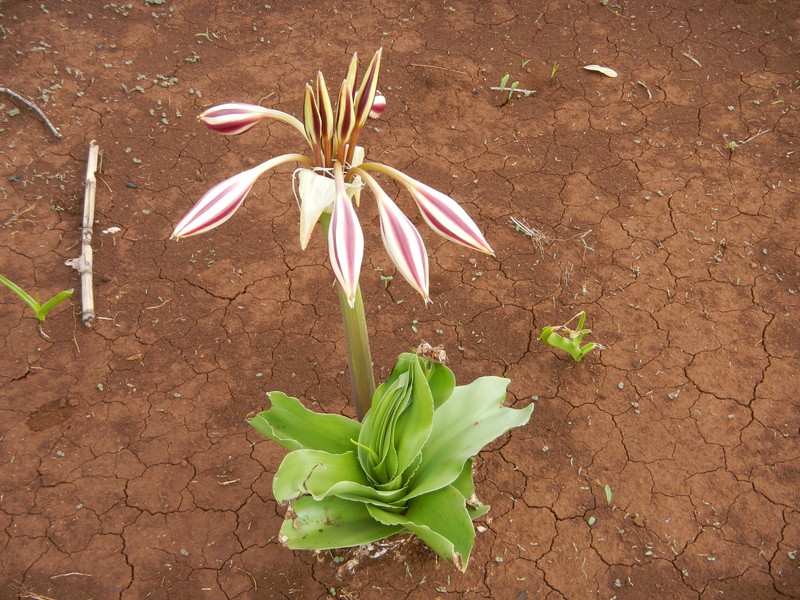 Seems that not only does this lily bloom but once a year…its bloom only lasts a day or so. My patience paid off, but my timing was sorely out of whack! “Patience is a virtue!” “Timing is everything!” I hear those old sayings run through my mind as I reflect upon this flower. And who can argue? When we were in church a week ago, at St. Joseph’s, raising money to finish the building and improvements that were originally planned over a decade ago, one of the pastors pointed out to the congregation that for a decade the church had waited for exactly the moment we now experienced…that now was the time…that this day would be the day to fulfill the years of waiting. And it was. It truly was. We raised the money that was needed; reached our goal! I do not know if we would have raised the same amount a week earlier or a week later, but that day and that moment was “the time”…and worth waiting for. Patience and timing….patience and timing…neither have ever been my long suit. When I first visited Kenya, in 2006, I remember looking at all the ruins of buildings, and sharing with our driver – now a good friend – how sad I was to see so many buildings falling to ruin. David looked at me rather puzzled and asked where I saw such a ruin. I pointed the next one out to him, and he laughed and explained that it was not a ruin, it was in the process of being built, and that the owners were simply waiting until they had more money available to build once again. What I thought was tumbling down was building up. I learned that while in the U.S. we obtain financing and then build, in Kenya they build until they run out of money, and then wait until they get more money and build another little bit, repeating the process until the building is up. It may take years, but their buildings are almost always debt free. I have preached here in churches that took 20 years to finish in that way. Patience and timing…patience and timing…each are gifts Kenyans hold in abundance. Kenya is teaching me to be patient…not exactly an American cultural value…and Kenya is teaching me to be willing to move when God tells me “move”. Both take an inordinate amount of faith and trust. But you know what? While my history is littered with lost opportunities, Kenyans seem to faithfully find fulfilled opportunities….no matter how long it takes. I’m learning…slowly, but learning. And now I am waiting yet another year for my lily to bloom once again. I am learning the patience to wait. I am trusting that I will also learn the timing needed to honor the patience! You can bet I will have my camera waiting. Several have asked that I put them together and publish, but I dunno……….Hell! I’m supposed to be retired! Signup for our newsletter to get the latest news on what's happening. Click here to subscribe to our newsletter! Nina Smith on So What Really Matters?